Planning an environmentally-friendly wedding sounds like a great idea, but a difficult concept to pull off, right? Wrong! We’ve gathered together some simple projects and ideas to make going green easier than you’d think! Not only will you not need to rent a limo to bring you from point A to point B, but this also cuts down on the amount of travel your guests will have to do. You may also consider exiting your wedding on a bicycle or horse-drawn carriage. Using natural fibers are kinder to the environment because they are easier to manufacture, as well as easier to clean. Avoid fabrics that require dry-cleaning, which use harsh chemicals. Whether it be a consignment store find or a family heirloom, choosing a used gown or suit is a great way to be green. You will conserve the many resources it takes to create, manufacture, and ship a wedding garment by choosing one that is already done. Invitations are a vital piece to every wedding, but you can greatly reduce the impact their materials have on our planet by choosing 100% recycled paper and plant-based inks. You can also create a postcard-style RSVP card, which uses less postage, and does not require an envelope, saving paper. Most flowers you see in stores and floral shops have been shipped in from long distances. Instead, select flowers native to your area and choose blooms that are in season. You can also use flowers that are organic, which are not treated with harsh pesticides. A sustainable resource, and the perfect alternative to most candles you find on the market. You can find soy candles locally at some craft stores or your local natural food store. If you haven’t been able to locate these candles locally, you can buy them in bulk at save-on-crafts.com. 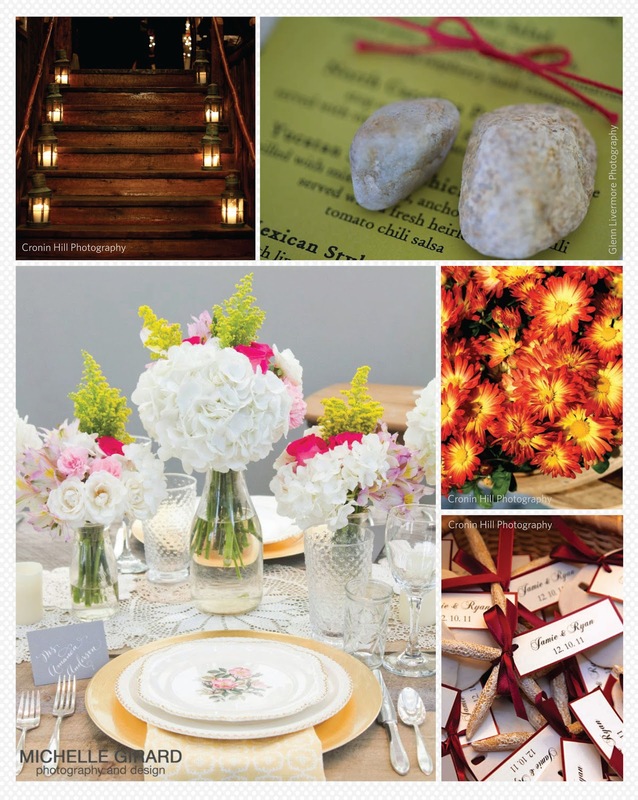 Gather found objects such as glass bottles, wooden containers, rocks, even dishware, to create unforgettable table settings, centerpieces, and other arrangements. Instead of making what seems like a million of those little table seating cards, use your favors! You can also choose favors that are green, such as flower bulbs or seeds, small plants, or fruit. The more local goods and services you can take advantage of, the better. Anything that gets shipped in for your wedding adds to the energy used to produce or ship it, including flowers, food, clothing, and decorations. At Riverside’s Amee Farm, we grow our own food which we readily use in creating your wedding meals. 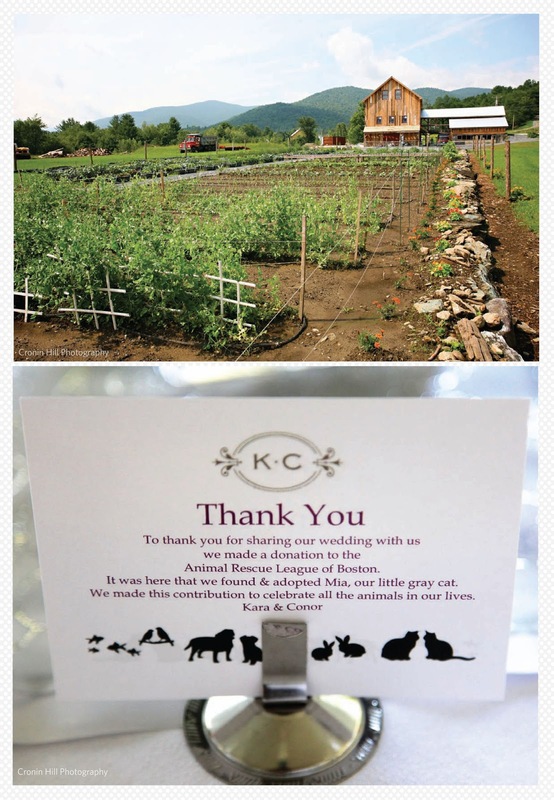 In lieu of favors, donate to a charity instead. You can also consider donating your flowers to a local hospital, nursing home or hospice (check with your local institute’s policies first and pre-arrange the drop off). 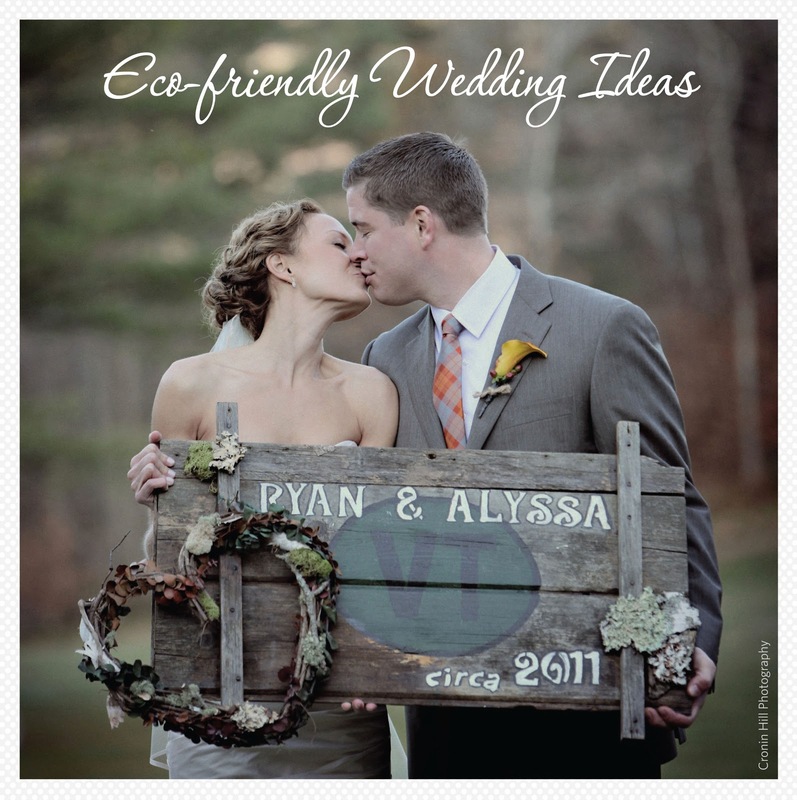 Not only is it easy to incorporate eco-friendly ideas into your wedding, but it is also stylish. By using some of these tips above, you can create a wedding that is sure to be one to remember but is gentle on our environment.